Based in London, UK, CAOS Conflict Management is a leading Mediation and Conflict Coaching Provider and Training organisation with over 20 years of experience working in a wide range of dispute, complaints and communication breakdown situations. Group Facilitation - for creative problem solving, teambuilding, group disputes - bespoke service, please contact us to request this. Training in Mediation Skills, Conflict Coaching, Managing Conflict in Teams and other Groups - for organisations and individuals. At CAOS we start from the understanding that for each of us conflict is inevitable and rather than it being a 'bad thing', it is an opportunity for Learning, Connection and Insight - for organisations and individuals. Creativity is the means through which conflict is resolved, and Mediation and Conflict Coaching support the creative thinking that enables different responses to conflict to emerge when it is acknowledged that the present responses are not working. All of our practices, whether mediation, conflict-coaching, training or facilitation are designed to enable the client(s) to create answers to their own identified difficulties. CAOS doesn't provide ‘quick-fix’ or ‘sticking plaster’ solutions for any client. We provide a range of supportive but challenging conflict management processes that enable the client to transform their own situation, so that the learning and change which they create is sustainable for the future and transferable to other, similar situations they may be involved in. "Promoting Mindful Communication, Growth Through Conflict"
CAOS Conflict Management, based in London, UK, provides Mediation, Conflict Coaching and Training in Conflict Management Skills. This page outlines the cost of mediation and other conflict management services including training and conflict coaching provided by CAOS Conflict Management. CAOS has an ever growing number of partner organisations wishing to manage conflict through mediation, conflict coaching and training and consultancy. Conflict Coaching is provided by CAOS Conflict Management for individuals experiencing unresolved conflict and difficult relationships. CAOS Conflict Management Training covers Mediation skills training, Conflict Coaching skills training, Peer-to-Peer Resolution support training for student conflict and workplace conflict resolution, Dealing with Difficult Behaviour, Meeting skills training. 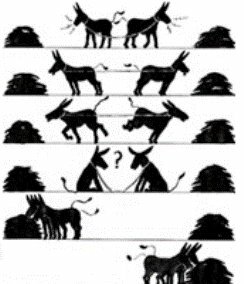 London Mediation Service - CAOS Conflict Management provides mediation services, for workplace disputes, NHS complaints, University student complaints, family conflict, community disputes, group disputes and others. CAOS provides university student complaints mediation - and complaints mediation skills training - for use alongside University Student Complaints procedures. 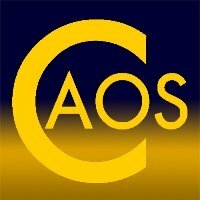 This page keeps you updated with any new web pages and changes to the CAOS Conflict Management website. High-hedges mediation is available from CAOS for support in resolving difficulties between neighbours over such issues as overhanging branches, leylandii, boundary issues etc. CAOS provides workplace conflict management training in themes such as 'Dealing with Difficult Behaviour', 'Managing Conflict in Teams' and many more, tailor-made courses for your organisation. CAOS provides communication skills training to help individuals and groups interact more effectively and amicably. Are you or your team struggling with communication challenges? Give us a call on 020 3371 7507 for help! Dealing with difficult behaviour training for helping professionals including charity workers, health professionals, voluntary workers, advice workers etc. CAOS Conflict Management provides workshops on Managing Conflict in Teams to introduce Principles of Effective Communication and Conflict Resolution that support effective responses to team conflict. Mediator Mentoring - Practice Support - First One Hour Session £30! Mediator Mentoring from Alan Sharland and CAOS Associates - drawing on over 20 years of mediation experience in a range of different fields of practise. Training in effective meeting skills and structures for management committees of community groups, businesses, project management groups etc. 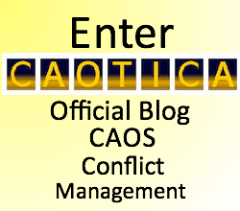 Enter CAOTICA, the CAOS Conflict Management Blog for News, Views and Insights relating to Mediation, Conflict Coaching, Mindful Communication and other Creative Responses to Conflict. Leadership Coaching for Conflict Management - How leaders can use professional and organisational conflict as a positive learning and development opportunity. How do HR Managers deal with allegations of bullying at work in a way that helps to re-establish and maintain working relationships? Here's a way that can and does! This page describes the CAOS Conflict Management model of mediation and conflict coaching used by CAOS trained practitioners. If you are looking for a CAOS-accredited Mediator, this page lists those who have trained in our model of mediation and who continue to review and develop their practice. CAOS-Accredited Conflict Coach List. This page lists those who fulfil the requirements for maintaining their accredited status via regular review and improvement of their practice. Student Group Work Conflict can arise when students are asked to work co-operatively on a project as part of their studies. This 2-day training course trains university staff in the skills of supporting Peer-to-Peer Resolution of student conflict. London, UK based mediation consultancy services for organisations, community and family related issues. CAOS is long-established Mediation Organisation. with CAOS Conflict Management and join the CAOS Learning Community of Mediators and Conflict Coaches and benefit from the follow-on support for your practice that training with CAOS will bring. Subscribe to CAOTICA Free Newsletter: Updates,views and insights from the world of mediation, conflict coaching, creativity, communication and conflict management.